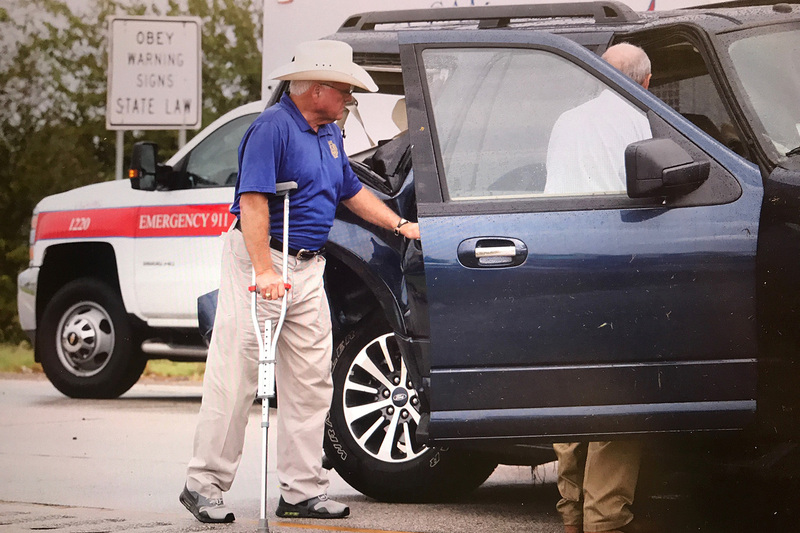 "Miller, Perdue, Conaway uninjured after car accident on Harvey damage tour" was first published by The Texas Tribune, a nonprofit, nonpartisan media organization that informs Texans — and engages with them — about public policy, politics, government and statewide issues. Editor's note: This story has been updated with a statement from the USDA. Texas Agriculture Commissioner Sid Miller, who was in the final car in the caravan, was unhurt, as were USDA Secretary Sonny Perdue; Conaway, R-Midland; and other staffers on the trip. "We were very lucky," Miller said. The politicians were touring the Houston area to inspect agricultural damage wrought by Hurricane Harvey. The officials had just heard from local agricultural producers and were headed to a press event, which has since been canceled. Texas Tribune photographer Bob Daemmrich, who witnessed the accident, said an SUV-type vehicle carrying support staff — the third vehicle in the motorcade — pulled onto the frontage road of Highway 59 in El Campo and collided with a semi truck. Daemmrich said the truck careened across the median carrying the SUV with it, and both ended up on the opposite side of the highway. Daemmrich said there were four people in the SUV. Miller said the staffers taken to the hospital were conscious and talking when they left the scene. All three were discharged from the hospital Thursday afternoon, according to a statement from the USDA. 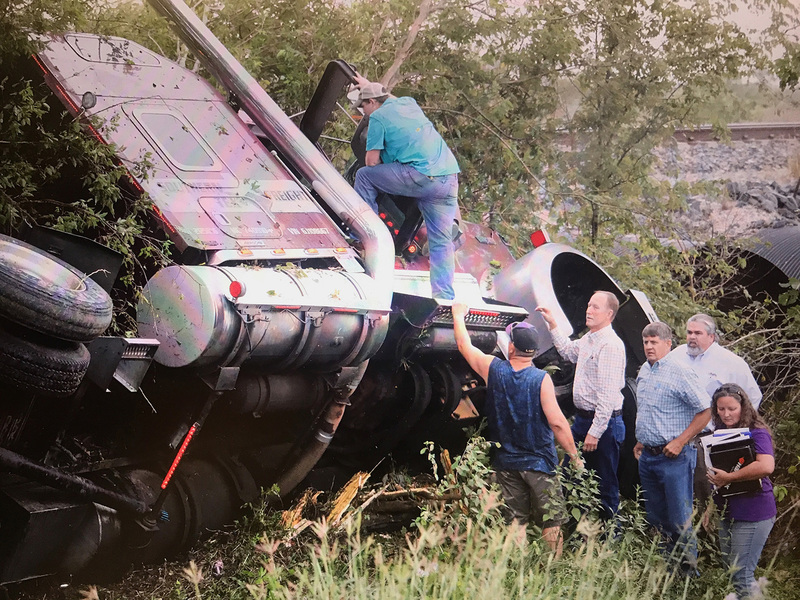 Miller, Perdue, Conaway uninjured after car accident on Harvey damage tour By Emma Platoff September 21, 2017 Editor's note: This story has been updated with a statement from the USDA. Two staffers for U.S. House Agriculture Committee Chairman Michael Conaway and one from the U.S. Department of Agriculture were sent to a hospital near El Campo on Thursday after a major car wreck that interrupted a government tour of hurricane damage to agricultural production. Texas Agriculture Commissioner Sid Miller, who was in the final car in the caravan, was unhurt, as were USDA Secretary Sonny Perdue; Conaway, R-Midland; and other staffers on the trip. "We were very lucky," Miller said. Texas Agriculture Commissioner Sid Miller in the aftermath of a car wreck that sent three staffers to the hospital. Miller was uninjured. Bob Daemmrich for The Texas Tribune The politicians were touring the Houston area to inspect agricultural damage wrought by Hurricane Harvey. The officials had just heard from local agricultural producers and were headed to a press event, which has since been canceled. Texas Tribune photographer Bob Daemmrich, who witnessed the accident, said an SUV-type vehicle carrying support staff — the third vehicle in the motorcade — pulled onto the frontage road of Highway 59 in El Campo and collided with a semi truck. Daemmrich said the truck careened across the median carrying the SUV with it, and both ended up on the opposite side of the highway. Daemmrich said there were four people in the SUV. Miller said the staffers taken to the hospital were conscious and talking when they left the scene. All three were discharged from the hospital Thursday afternoon, according to a statement from the USDA. Bystanders examine the damage from a Sept. 21, 2017 car wreck that sent three government staffers to the hospital. Bob Daemmrich for The Texas Tribune Read related Tribune coverage Abbott, Paxton send Trump letter requesting FEMA funding for churches U.S. House sends Harvey aid bill to Trump – despite 4 Texans voting against it Texans in Congress aim for united front ahead of long fight for Harvey aid "Miller, Perdue, Conaway uninjured after car accident on Harvey damage tour" was first published at by The Texas Tribune, a nonprofit, nonpartisan media organization that informs Texans — and engages with them — about public policy, politics, government and statewide issues. Link back to the original article, which is located at https://www.texastribune.org/2017/09/21/two-sent-hospital-after-usda-car-wreck/.